Are you a fan of Laura-Jane the Rawtarian?? I am because she makes raw food easy! She is famous for recipes that are simple because they don’t go overboard on ingredients. She has a new dessert book called “Too Good To Be Raw” . 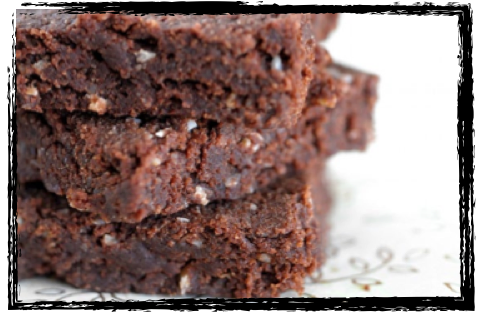 Laura Jane kindly extended a sample recipe for you to try, her decadent “Classic Brownies”. Try them and post your comments below. I made a batch this morning and took them to the office to share. I have one happy office over here!! 2. Add dates and process again until the mixture sticks together and the dates are well processed. 4. Dump the mixture into a brownie dish or small cake pan and press down firmly using your clean hands. You can eat now, but the recipe will slice better if you refrigerate for at least on hour. 5. Store brownies in the refrigerator at all times. Comment below to let me know how your raw food recipe from Laura-Jane for Classic Brownies comes out! If you love ’em like me, get your copy of her new book “Too Good To Be Raw” today. These look delicious! and I cannot wait to make them! I was wondering though if there is anything that can replace the pecans- they tend to give me sores in my mouth when I eat them. Pay special attention to those mouth sores and when they occur. A non-STD form of the herpes virus may be the culprit. If so, foods high in arginine will wake up the virus for a break out party! Avoiding foods high in arginine; peanuts, peanut butter, cashew nuts, pecan nuts, walnuts, almonds, chocolate, coconut, cereal grains including white and whole wheat flour, dairy products, gelatin, meat, oats, soybeans, and edible seeds. Provided your issue has nothing to do with that pesky little virus, which experts say affects more than 75% of the US population, then I would try subbing out the pecans for walnuts for a stronger flavor or cashews for a creamier brownie. I should share that I had cold sores- BAD. And I overcame it ALL TOGETHER by alkalizing with green drinks & salads and switching to a high-raw diet. Once I maintained balance in my body- I could enjoy those high arginine seeds, nuts & grains (I soak/sprout them first) with no cold sores! The body is an amazing healing machine when we bring it into balance with plenty of greens & whole foods. Keep me posted on how you do. Glad you like the Jane. 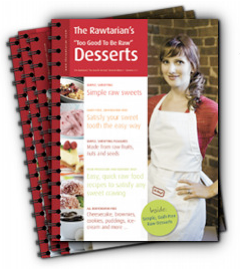 I am a big fan and her books are an awesome choice if you are looking for more inspiring, healthy dessert options.